"He will challenge their traditions. Their traditions will change his life." Movies that involve dancers have become popular across the world. Stomp The Yard is an intense musical and drama movie. It was written by Robert Adetuyi and directed by Sylvain White. Columbus Short plays the main character DJ Williams. He is a krump dancer from LA. Famous pop artist Chris Brown plays his younger brother Duron. They are a part of a local dance crew called The Goon Squad. The Goon Squad competes for cash at local dancing competitions. After the first intense victory in the movie, the losing team start a fight with DJ and the other members of The Goon Squad. The lead man of the group shoots Duron and he is killed. DJ is arrested for assault. After he gets out, his mother decides to send him to Atlanta to stay with his Aunt Jackie and Uncle Nate. DJ is sent to study at a local university. He meets April, which is played by Meagan Good. R&B artist Ne-Yo plays his new roommate, Rich. Rich introduces DJ to the Atlanta world of stepping. DJ is very interested in April. He learns that she is doing tutoring sessions and he signs up. April is seeing a man named Grant but soon leaves him for DJ. The two form a value friendship and more. Rich and DJ are now a part of a sorority called Theta. Theta is a lot like The Goon Squad. DJ teaches Theta krumping. DJ has to go up against April's ex-boyfriend Grant. Theta results in a victory. They win the national competition. Stomp The Yard is rated PG-13 for mild violence, language and sexual situations. Parents don't have to much to worry about. There isn't intense language or sexual situations in the movie. The viewers of this movie will more than likely be teens. Teens can relate to the many aspects throughout the film. The movie may introduce some teens to start dancing. Friendship and family is very important in Stomp The Yard. Viewers can expect to learn how to handle hardships and gaining and losing friends. Parents can watch the movie first and then decide if it is something they want their children to see. Many people enjoy the music and beats in a movie like Stomp The Yard. It is said to get the viewers entertained the whole time. Most teens will recognize the songs in the movie. The music is more up to date. The movie was released in 2007 so most songs were popular around that time. 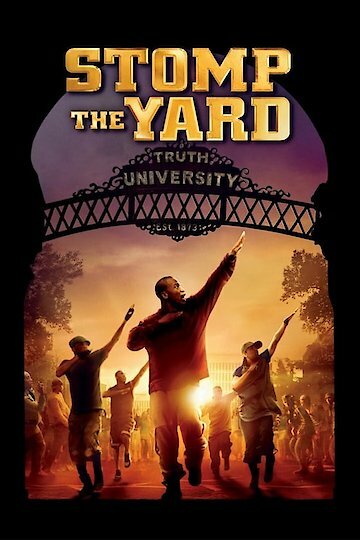 Stomp the Yard is currently available to watch and stream, download, buy on demand at Starz, Amazon, Vudu, Google Play, FandangoNow, iTunes, YouTube VOD online.